Today on the Sizzix blog I share a step by step tutorial on how I assembled these birds after using one of Kid Giddy’s Sizzix dies. QuiltCon is less than a week away and I just now finished my first sewing project for the trip! 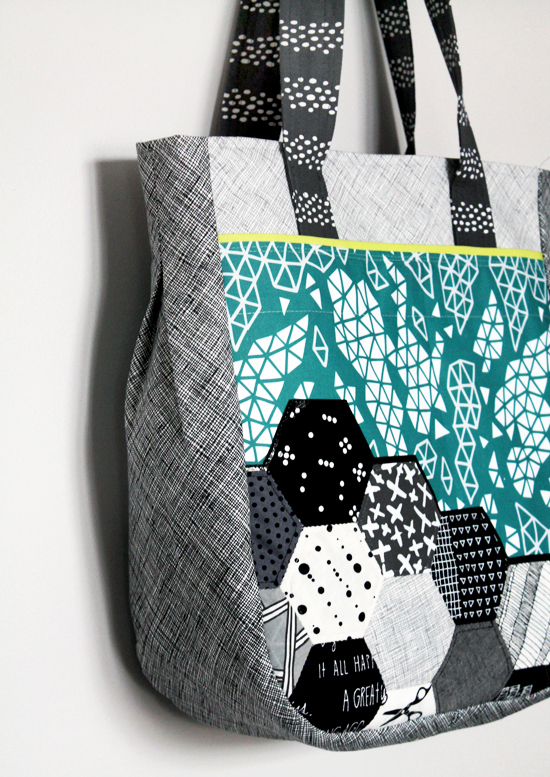 I had this crazy plan to make two tote bags (one featuring my fabric and one as part of a contest/promotion that I’ll talk about later), a drawstring bag, a makeup bag, a zipper pouch, a dress, a brooch, and a 100 or so hexagon pins to hand out. Whew, yep, crazy lady here. Most of the projects are about 75% done, which is pretty impressive for me. I’m normally a “the night before a trip and I am still sewing and refuse to sleep until I get on the plane” type of girl. I think I was just too excited about all of this selfish sewing! Ok, now let’s actually talk about the bag I keep showing photos of! This is the most intricate bag I have ever sewn from a pattern. Do you see those gusseted sides? Normally when I need a tote bag I just throw some squares and some straps together and call it a day. This is QuiltCon though! I will be surrounded by loads of other talented people who appreciate what goes into such projects. So no thrown together bags for this event. Instead I made a Super Tote using a pattern I bought from Noodlehead. The pattern cost $8 and is worth every single penny. As for the fabric I used my own designs printed by Spoonflower for the front, straps and zipper pieces (if theres any interest I’ll put them up in the shop next month). The sides, lining and top front piece are from Carolyn Friedlander’s Architextures line through Robert Kaufman fabrics. There is also a hint of Alison Glass’s Grove fabric in beet as an organizer in the front pocket. 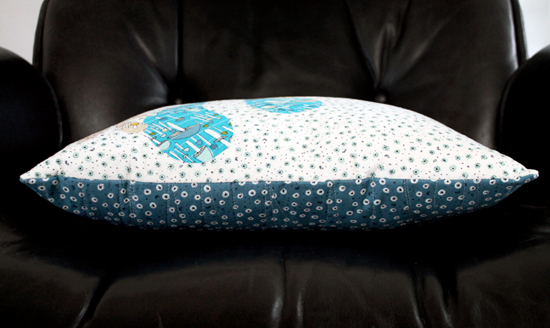 All of the hexagons were actually taken from another project I’m working on and the fabrics are by different people. The shiny fabric around the hexagons and used as zipper ends is a glossy black oilcloth I bought years ago for embroidered collages I use to make. There is also a bunch of heavier weight interfacing used that helps give the bag its shape and strength. Overall, I think all these fabrics blended so well together and really show my personal taste! This inside of this bag was actually really hard to photograph! It was so dreary here and I just couldn’t seem to show just how spacious and versatile it is! I altered the inside pattern slightly by adding a zippered pocket on one side. This was to securely hold my inhaler, medication and anything else I truly can’t live without. Plus I like to have these items separated from everything else so theres no digging around, freaking out, while having an attack. The rest of the divided gathered/elastic pockets were part of the pattern. They are perfect for an event like Quiltcon where I’ll be picking up random bits and pieces all weekend and I’ll be able to divide them up and not just have a mound of crap on the bottom of my bag. Plus I’m taking a workshop one of the days, so this way i can keep my supplies separated from anything else I buy or am given. The front pocket was even harder to photograph than the inside! It’s so slim and flat, it just wouldn’t stay open. As with the interior of the bag, I also altered this part a little to fit my needs. I had seen on the From A Blue Chair blog where Kati added a small organizer type of pocket inside the front pocket. It was brilliant! (you should check out her post too! She did a few other alterations that were great and worth reading about!) So I used a super bright purple fabric and stitched up three dividers to help me hold my phone, business cards and extra pens (or business cards I’m given). This way I can get to all of those items super fast without taking the bag off my shoulder. As you can see, I used a magnetic closure to secure the pocket when not in use. The pattern suggests this option, velcro or nothing at all. I think the magentic closure looks best. Thats just my opinion though. I think thats it. Who knew I could type so much about one bag? Wait until I start talking about the next bag!! Hahaha. If you will be at QuiltCon, please look out for a girl with purple hair, carrying this bag! If you see me, please come say hi. I have some sparkly goodies for anyone who does. 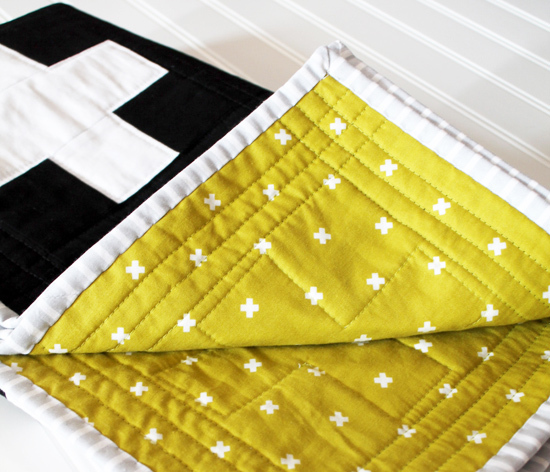 I’ve been making baby quilts lately as a form of therapy and as skill building exercises. The size is perfect because one yard of fabric fits on the back and I can sandwich everything together on my work table. However my little one is starting to outgrow this size and I really have no use for a stack of baby quilts. Soooo I added them to the shop! I priced them according to quilts similar in quality and design that I’ve seen online. I don’t plan on taking custom requests and won’t update quilts non stop, but it’s nice to know that if I have an idea I can test it out and it may end up finding a new home one day, not just sit on my shelf and get dusty. 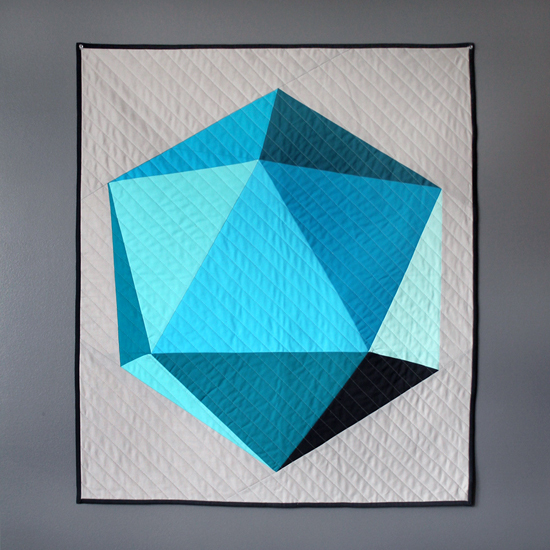 And the icosahedron quilt made up of lots of blues and grays. I’d love to hear your thoughts about these pieces and anything else that may be on your mind right now!! Back in July, I took place in a collaboration between Cloud 9 Fabrics and Silhouette America. I was sent an awesome fat quarter bundle of Cloud 9′s new line Arcadia by Sarah Watson to make something using my Silhouette CAMEO. All they asked of me was to make it an applique project. I had so much fun designing and making this project! 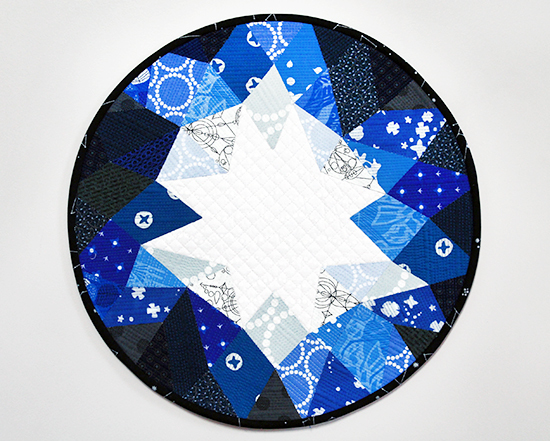 I wrote up a full tutorial, with pictures, over on Silhouette America’s blog. Trust me when I say, this project was way easier to make than it looks!